On Thursday September 1st, we continued our journey southwest along the shore of Nova Scotia with a 42 nautical mile run from Lunenburg to Port Mouton (pronounced Matoon), passing numerous fishing boats along the rugged and rocky shore line. We did not go into the village of Port Mouton, opting instead to anchor at Carter’s Beach. This was a stunningly beautiful anchorage with a long and lovely white sand beach with lots of locals braving the cloudy, cool day to walk the beach. Some even went to far as to swim in the decidedly cold water. As it was just an overnight stop, we did not lower our dinghy and go ashore to explore. On Friday, we were up and underway by 0630 under a clear sky and light winds, headed a further 39 miles to Shelburne, Nova Scotia. 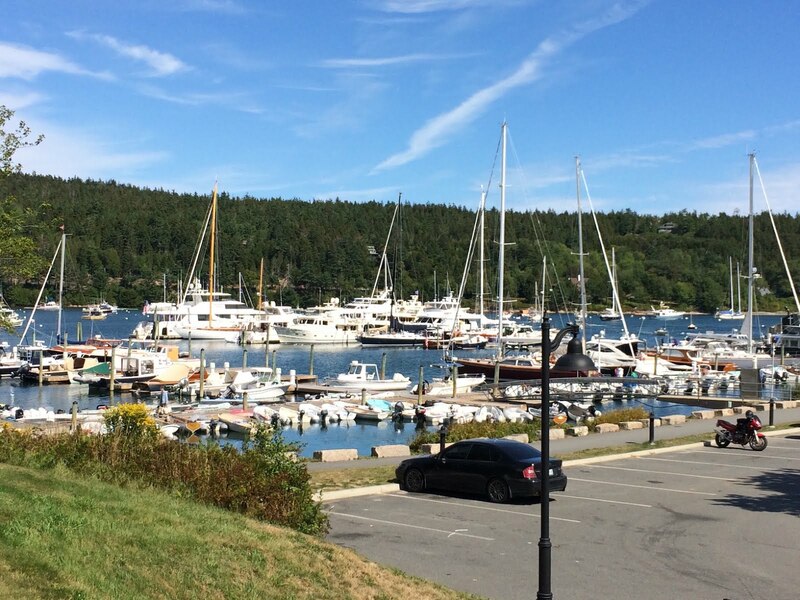 We took a mooring at the very hospitable Shelburne Yacht Club. 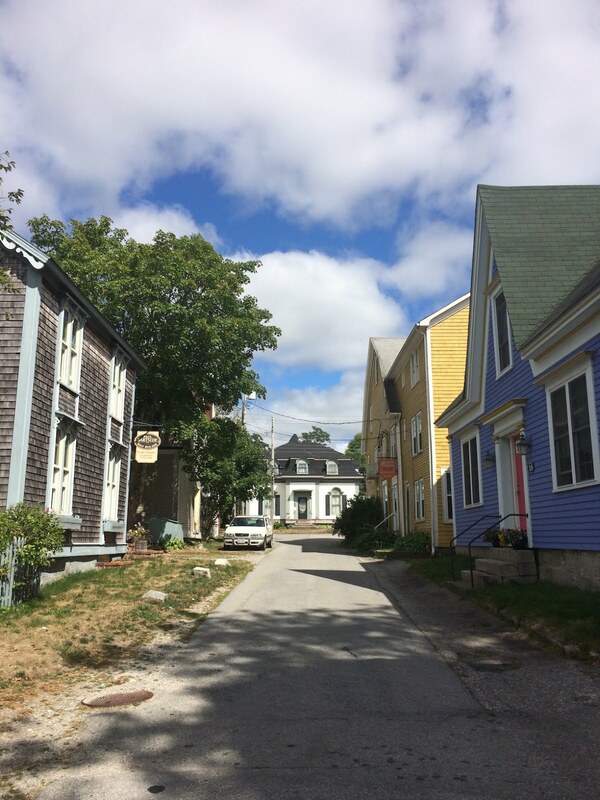 Shelburne is a very picturesque town that was founded in 1738. The first Europeans to settle here were French Acadians who established a small fishing settlement. After the British expulsion of the Acadians in 1755, there were no further settlers in the area for almost three decades. In 1783, about 5,000 settlers came to Shelburne form the New York area. They were United Empire Loyalists who opposed the American Revolution and wished to remain loyal to Britain. The Crown offered them free land, tools and provisions to attract them to Shelburne. At the same time, the Black Loyalists, a large group of black slaves who escaped from the rebels to British lines, were promised freedom and free land. They were evacuated and transported by the British to Shelburne, which became the largest free Black settlement in North America. But the Black Loyalists endured long waits for their land, they got smaller parcels than the whites and they faced discrimination from other colonists. In 1784 the whites conducted Shelburne Riots against the African Americans. With multiple waves of settlers, by 1783, Shelburne’s population ballooned to 17,000 making it the 4th largest settlement in North America. However, with a lack of agricultural land and too few pioneers who knew how to develop the land, Shelburne’s population fell sharply. Its remaining population focused on fishing and ship building. Another notable event occurred in May 1945 following Germany’s surrender to the allies, German submarine U889 surrendered to the Royal Canadian Navy in Shelburne. Our adventure for this summer was going to finish up in Maine and for several days, we’d been discussing how best to complete the crossing from Nova Scotia to Maine, across the Bay of Fundy. 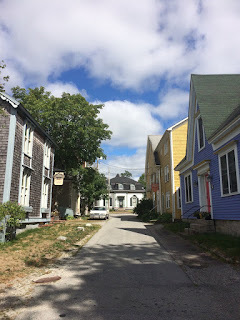 Initially, we’d planned on a series of multiple stops (Yarmouth to Brier Island, to Grand Manan Island and finally checking in to US Customs & Immigration at Cutler, Maine. This route would involve relatively short runs of between 30 and 50 nautical miles. Hurricane Hermine (4th named Hurricane in the 2016 Atlantic Season) was an unplanned complication that was going to cause multiple days of strong ocean swells that could cause us to have to wait in one of these ports. Also, these ports all had fixed piers (as opposed to floating docks) and tides of 5 1/2 meters all of which were vulnerable to the forecast southerly ocean swells. Taking all this information into account, we concluded we were best to depart Shelburne around 1300 hours on Saturday September 3rd, round Cape Sable Island at about 1730 hours and get clear of a variety of other smaller islands and shoals south of Yarmouth before dark. 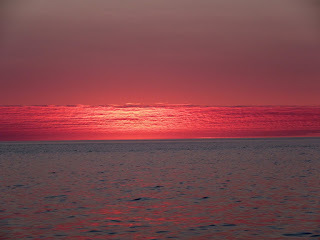 Then we’d be on a straight course for Maine throughout the night and we could adjust our speed as needed so we’d not arrive along Maine’s lobster fishing shore before daylight. Fran and I had done several “overnighters” on previous boats and were fairly comfortable with the idea. The others had a little less experience but all agreed this was our best strategy. Looking at the forecast for the coming seven days, there was no better weather window than what we had for the next two days. Despite our previous experience, I find my mind becomes a whirl of thoughts and a sound sleep is not possible. When we got up Saturday morning we were excited to get going, but kept ourselves occupied until 1300. Winds and waves were lighter than forecast. On our way to Cape Sable Island, I spotted a large flock of seagulls prompting Fran and I to grab binoculars to check what they were doing. What a wonderful surprise - a group of humpback whales were doing their organized bubble feeding and the seagulls were taking advantage of their activity too. Rounding Cape Sable Island we got a great “push” from the tidal current adding as much as 2.8 knots to our speed for a while. 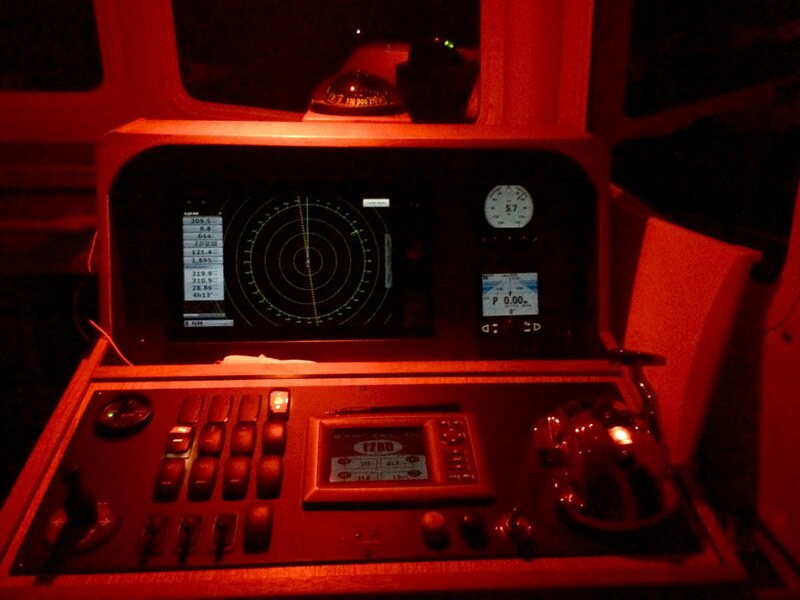 Before it got dark, we figured out how to dim all the lights on the navigational equipment. We have dim red lights in the pilot house for night cruising and nearby switches for white lighting were taped over so we wouldn’t turn them on by mistake and mess up our night vision. As dusk arrived, we started our 2 hours on, 2 hours off shifts with Fran taking the first 2000 to 2200 hour shift. The three boats fell into a line about a half mile apart so we could always see the navigation lights of each other and we were in regular contact via VHF radio. The sky was a clear but moonless night, the winds remained light, there was very little boat traffic and the half meter swell has hardly noticeable. We simply couldn’t have asked for better conditions. 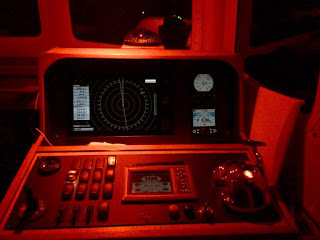 As the boat was being steered by autopilot, for the person on “watch”, most of the time was spent staring at the radar screen to see if any other vessels showed up as a new blip on the screen. If one of us spotted something, we’d alert the other two boats so the three of us could keep track and determine if there was a risk to us. I took the 2200 to 2400 shift, munching on peanuts and other snacks to keep alert. I also kept singing that famous song "Farewell to Nova Scotia" to myself. Farewell to Nova Scotia, the sea-bound coast,may your mountains dark and dreary]be.For when I am far away on the briny ocean tossed,Will you ever heave a sigh or a wish for me? Fran surprised me on her 2400 to 0200 shift as she decided not to wake me and she continued on until 0400, which was a lovely treat. 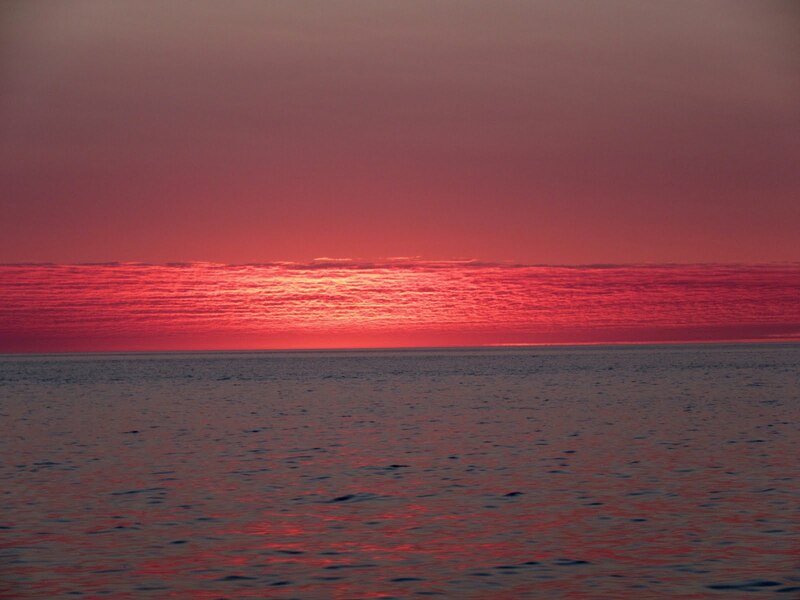 Through her shift, the three boats spoke regularly about the remaining distance to go before daylight and when we expected to see lobster pot floats and gradually slowed the boats down so we wouldn’t arrive too early. Sure enough, right after sunrise, the first lobster pots appeared. We were in 250 feet of water and gradually the numbers of floats increased dramatically. Soon, we could no longer use the autopilot as a straight course was impossible. It seemed to us like the “wild west of lobster fishing” making us wonder how there could be any lobsters left on the bottom. 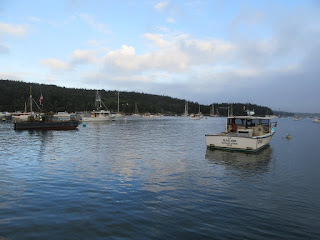 Fran woke up to quite a sight of lobster pot floats along with multiple whale and propose sightings all around us, such that Fran was afraid we'd hit one. En route, we phoned in to Customs and Immigration announcing our arrival, providing our names, birth dates, Nexus numbers, passport numbers, our boat information, our starting place and our destination. They called back half an hour later confirming we were cleared but they’d meet us in the harbour to sell us our cruising permit. After an hour and a half of dodging lobster pot floats, we arrived at our destination, North East Harbour on Mount Desert Island. Here was another first time experience for us. In addition to regular docks and mooring balls, the marina had a series of 40’ docks anchored in the bay, but not attached to shore. These docks allow two boats on each one, thus squeezing more boats in the harbour than mooring balls. Some of these docks also had a fresh water tap as well, which was very convenient. Mount Desert Island, home of Acadia National Park, looked very appealing to visit with its rich history dating back some 6,000 years. 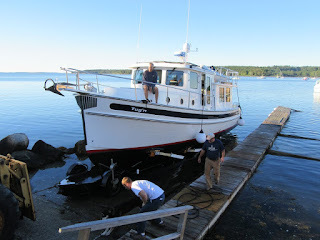 We will have to explore it next season as our time here is going to be devoted to preparing the boat for winter. 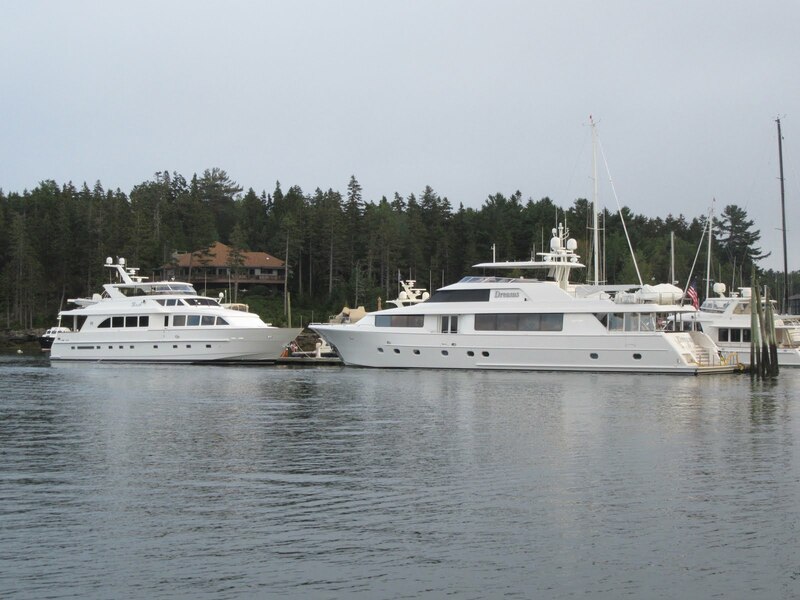 Monday was Labour Day, so on Tuesday, we contacted the Atlantic Boat Company in Brooklin, Maine to discuss timing of our haul out for the winter and agreed on Monday September 12th at 0715. They can only haul boats out at high tide, so it was going to be a bright and early haul out. We spent the intervening time getting our boat ready for haul out and winter storage by doing a wide range of tasks including washing and waxing the boat; engine and generator oil and filter changes, fuel filter changes, water maker winterization, washing all bedding, clothes & towels that would be bagged and stored on board for the winter, defrosting the two freezers, finishing up all our food supplies etc etc. Suffice to say, it was hard to stay awake after 2000 hours each evening as we were so tired from all the work. Recreational boats shared North East Harbour with many lobster boats who make daily treks out to pull up their traps, empty the lobster catch, rebate the trap and lower it again. Normally, they’d go to a commercial dock and unload their catch to an awaiting refrigerated truck before going to their mooring. One day Fran noted a loaded lobster boat was briefly moored behind us. 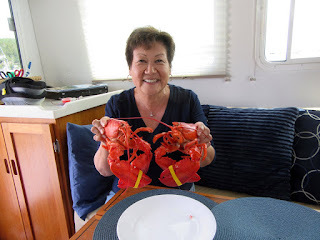 We motored over in our dinghy to see the fishermen and Fran purchased two 1 1/2 pound lobsters and less than an hour later they were cooked and cooling off in our galley. She cooked them perfectly, shelled them and they were one of our best seafood treats of the summer. Fran's two lobsters all cooked up! We moved the boats 15 nautical miles over to moorings at Atlantic Boat Company on Saturday September 10th, a perfectly lovely day. 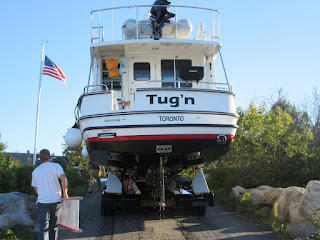 Haul out occurred as planned on Monday, followed by more washing and waxing of the hull, winterizing the water systems etc. We picked up a rental van on Tuesday and departed for home on Wednesday at 0620 hours. It was almost 1,200 kilometres to Oakville with four drivers taking 2 hour shifts. All was going well until we got stuck on highway 401 east of Kingston where the highway was closed for the day due to a horrific crash. That cost us over 3 hours delay and we ultimately got home just before midnight. 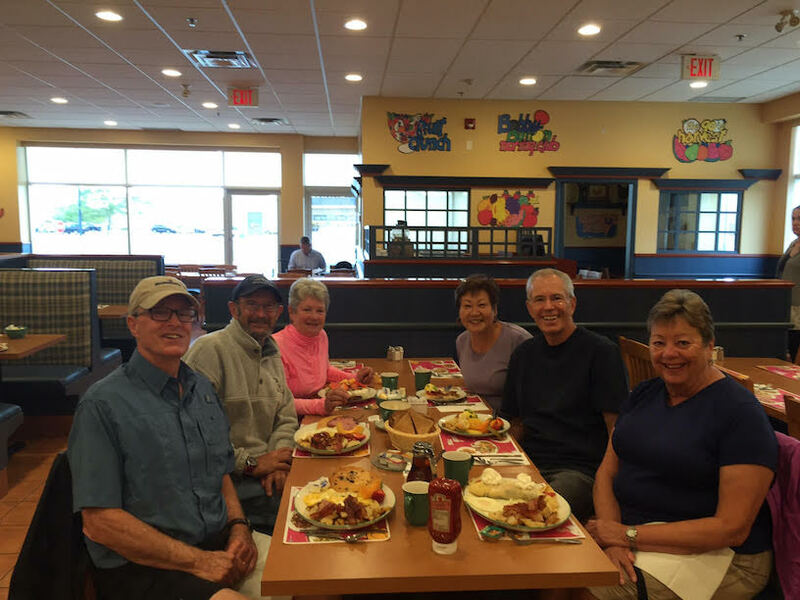 Bob, Jan, Dave and Judy stayed overnight at our place and then after a final group breakfast at Cora’s Restaurant, they were on the road again to their homes in Michigan. This is the wrap up for the end of Season One of our Down East Circle Route Adventure. What a privilege and magnificent experience we had. We got a much deeper understanding of the history and culture of the areas we visited and their importance to the development and shaping of Canada. We learned much about cruising in salt water, coping with tides and currents and learning to anchor in tides. 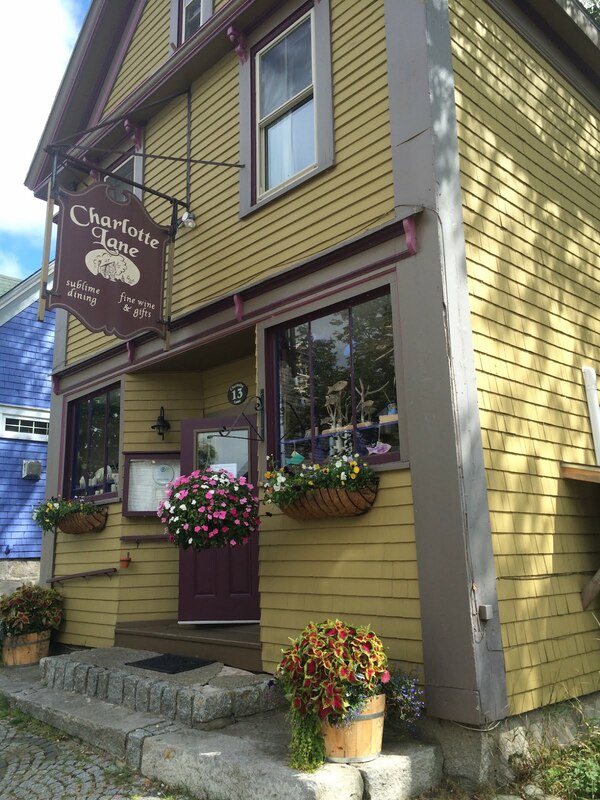 We enjoyed a wonderful diet of seafood this summer, both from our own galley and in local restaurants. Finally, we met the most wonderful and helpful locals. /Wherever we went, they were always curious about our trip and anxious to help us any any way they could. We’ve enjoyed documenting our trip in this blog and loved all the emails we got from some of those who followed us along on our journey. Stay tuned for Season Two in 2017.